Policing the Olympic torch procession cost taxpayers almost £6.5m nationally, according to a series of Freedom of Information requests by HMI Olympics. The spending includes the costs incurred to local police authorities throughout the UK for the 56 days the Olympic Torch went around the country. The Metropolitan Police Service spent the most – not surprisingly as the torch spent a week in London and was perhaps the most obvious target for disruption. 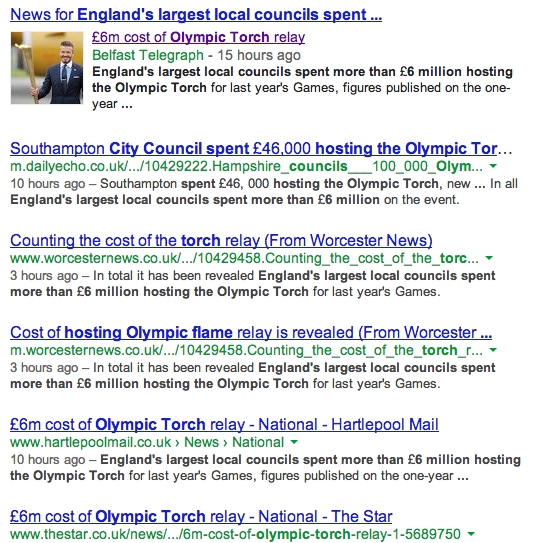 Dozens of regional newspapers across the UK have published the newswire story on the “£6m cost of Olympic torch relay” – first revealed on Help Me Investigate following Freedom of Information requests by contributors including Carol Miers, Juliet Ferguson, Jess Denham and Steve Walker.